Division of Pulmonary, Allergy, and Critical Care Medicine, University of Pittsburgh School of Medicine, Pittsburgh, Pennsylvania, USA. Address correspondence to: John F. McDyer, Division of Pulmonary, Allergy, and Critical Care Medicine, University of Pittsburgh School of Medicine, 3459 Fifth Avenue, NW 628, Pittsburgh, Pennsylvania 15213, USA. Phone: 412.624.8915; Email: mcdyerjf@upmc.edu. J Clin Invest. 2019;129(2):494–495. https://doi.org/10.1172/JCI126517. 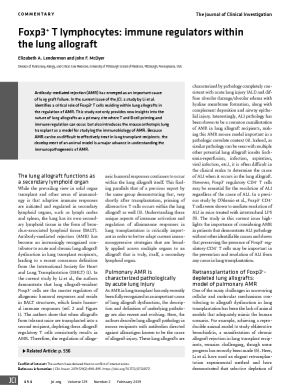 Antibody-mediated rejection (AMR) has emerged as an important cause of lung graft failure. In the current issue of the JCI, a study by Li et al. identifies a critical role of Foxp3+ T cells residing within lung allografts in the regulation of AMR. This study not only provides new insights into the nature of lung allografts as a primary site where T and B cell priming and immune regulation can occur, but also introduces the mouse orthotopic lung transplant as a model for studying the immunobiology of AMR. Because AMR can be so difficult to effectively treat in lung transplant recipients, the development of an animal model is a major advance in understanding the immunopathogenesis of AMR.